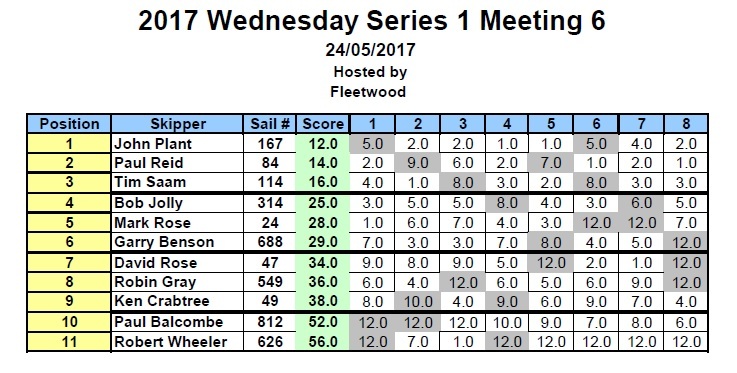 As you will see from the results table Shaun Holbeche dominated the fleet of nine who also had the added hazard of bandits at six o’clock ie Jelly Fish! This made for some amazing reversals of fortunes as they have no prejudice to who they cling to. Nevertheless, and even allowing for a very fickle WSW failing breeze, we managed eight one lap races and gained valuable tuning knowledge for the forthcoming Nationals. We are have another DF95 POP-UP this coming Bank Holiday – Monday the 29th – 10.30am. This is another golden opportunity to avoid the traffic jams and prepare for the Nationals in Milton Keynes. ← Fleetwood DF95 Squadron heads to Milton Keynes!